Egg biryani is one of the tastiest biryani. I have not tasted egg biryani from outside so making this biryani at home was a big task for me. The thing which confuse d me was the method of cooking. Whether to make it like a stir fried rice or like a proper biryani under dum. Till today i was confused regarding this and i asked my hubby which method shall i follow to prepare the biryani. He answered the Dum method. We are all a big fan of dum biryanis, so happy i fixed my mind and prepared the biryani according to our taste. This biryani came out really well. We never felt this is egg biryani. 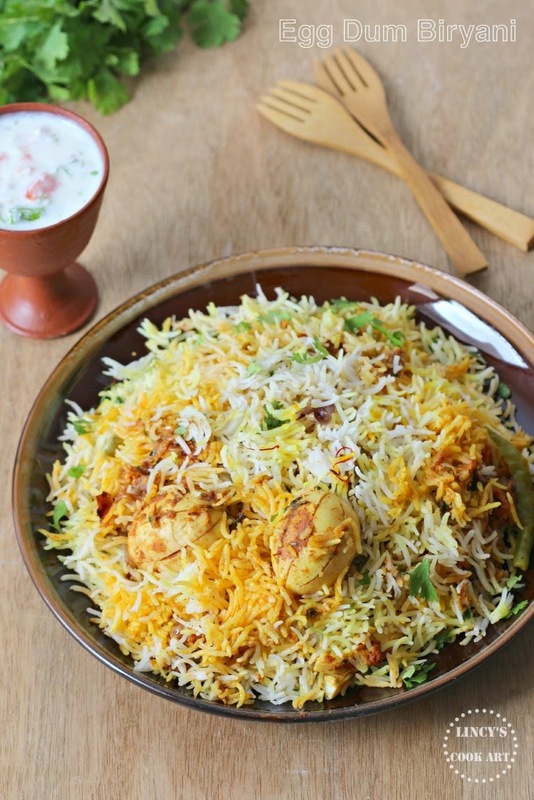 This biryani gives the satisfaction same as that of Chicken or Mutton Biryani. The gravy on the bottom with the sweet onions tastes really great with the flavoured rice.This is a 'Spicy Egg Dum Biryani' really worth the time taken for the recipe. To marinate the eggs, hard boil the eggs and peel them. Give shallow lengthwise 6-8 slits on the the eggs. In a bowl add the turmeric powder, chilli powder, garam masala powder, ginger garlic paste and salt. Drizzle little water and make it as a thick paste. Apply the paste gently over the eggs and the slits. Set aside till other ingredients are ready. To cook the rice, add the rice, enough water to cook the rice, salt, cinnamon, cloves, cardamom, shahi jeera, green chillies and a teaspoon of oil in a wide pan. Once the rice is half cooked drain the water and allow to cool in a flat wide plate. In a heavy bottomed pan add the add the oil and fry the onions till golden and remove fry the pan and set aside. In the same oil slightly roast the marinated eggs for just a minute to seal the masalas on low flame. Do not over cook the eggs. If you over cook the eggs the masala get burnt and spoil the oil and the biryani. Remove the eggs from the oil and set aside with fried onions. Now add all the masalas, turmeric powder, chilli powder and garam masala powder and cook for fifteen seconds. Add the yogurt and add some salt for the gravy and cook till the oil separates on top. Sprinkle some coriander and mint leaves over the gravy. Now spread the half of the fried onions and the roasted eggs on top of the gravy. Layer with half portion of the half cooked rice and top it with some of the fried onion, coriander and mint leaves, sprinkle 1/4 teaspoon of garam masala powder and drizzle a tablespoon of ghee. Again layer with the other portion of the rice and top it with some coriander and mint leaves, sprinkle some garam masala powder and drizzle a tablespoon of ghee. Soak the saffron strands in hot milk and allow to soak for 5 minutes. I have added some turmeric powder too for more colour. Drizzle this saffron milk over the biryani . Close with a lid tightly with aluminium foil and a lid or with a dough. Heat a tawa well and keep the biryani vessel on top of that and cook for 15 minutes under dum i.e. very slow flame. You could keep dum on direct flame if the flame is very low. Open the lid and serve from one side. Dig from deep down the egg with the masala and the rice. though i dont love eggs ....this biryani looks damn tempting..